Masaki Hirata, an associate professor of humanities and social sciences at Nagoya City University, started a project with his students to explore new and offbeat ways of introducing sightseeing spots in Nagoya to foreigners through the medium of English. The project aims to promote hidden tourist attractions such as maid cafes in the city’s Osu district and “Nagoya-meshi” — dishes popular in or unique to the city — to young foreigners. “We have to create more spots where ‘anime’ (animation) fans can enjoy themselves! How about creating some kind of a market for comic books?” one of the students said during the “cosplay” presentation. Last September, the 20 students in Hirata’s class were divided into four groups and researched tourist attractions by interviewing people in related fields and sampling Nagoya-meshi. Themes and foods introduced in the contest included Taiwan ramen that originated in Nagoya, a mazelike underground mall and tap water drawn from the Kiso River. The judging panel included Makiko Kumazawa, who interprets for foreign leaders and dignitaries during their visits to Japan. “There have always been English-speaking volunteer tour guides, but they are mainly housewives who do it to practice English, or retired men. 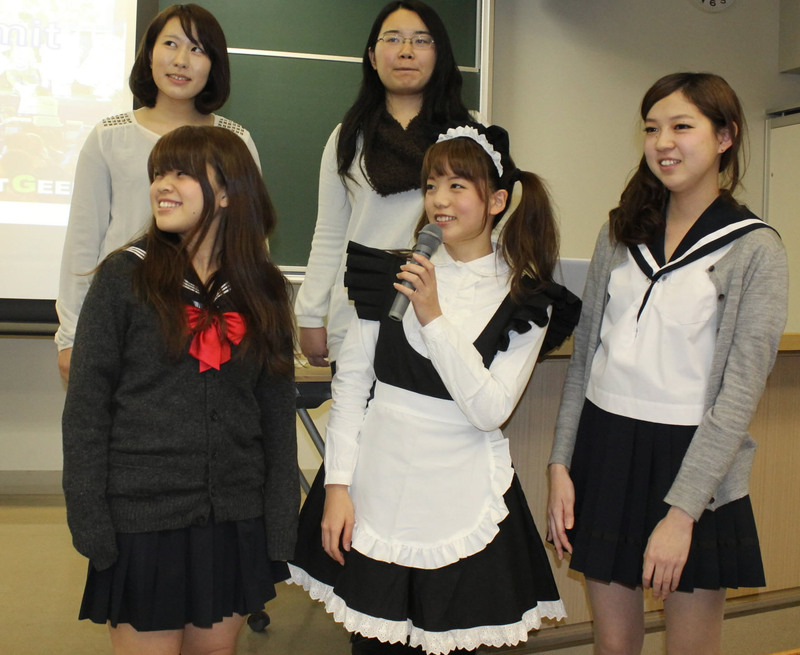 Only young students would have enough courage to give their presentation in costumes,” Kumazawa said. Hirata had long been aware that Nagoya is not exactly a tourist draw. “Nagoya has a weaker presence than Tokyo or Kyoto and there are still many unknown tourist attractions,” he said. According to a survey taken by the city, a little more than 440,000 foreign guests stayed in Nagoya’s major “ryokan” (inns) and hotels in 2011, down 28 percent from the previous year and the lowest figure in the past five years, due partly to the Great East Japan Earthquake, tsunami and nuclear crisis. “In preparing a guidebook in English, I realized very few existing pamphlets gave information on stores and restaurants that focus on young people,” said Kurumi Kako, 20, the leader of the group whose members attended the presentation while wearing a variety of costumes. This section, appearing Saturdays, features topics and issues from the Chubu region covered by the Chunichi Shimbun. The original article was published Jan. 28.